It is imperative that one sets things in place before putting out investments on a large scale production plan. Apparel Tech Packs set standards, processes and guidelines that clothing manufacturers can chart and track in order to physically sample the production pieces as designed by the clothing designer. Tech Packs augment the essential technicalities to fashion design sketches making it production ready. 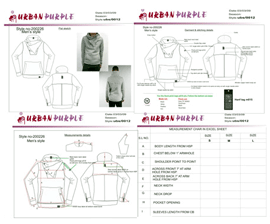 Fashion Studio Urban Purple provides you with right product detailing and specifications in the form of apparel tech packs that you can use to produce your garments. Our technical designers progressively examine the styles and conduct exhaustive analysis prior to designing the tech pack. We then deliver precise and production friendly apparel tech packs, making life easier for you and the eventual manufacturing house. We understand that your vision needs certain technicalities; we equip you with the required technical design assistance enabling your vision become a reality. As an apparel brand or a creative designer, your thoughts and vision need to be translated lucidly and accurately to help create the best fit solution for your requirement. 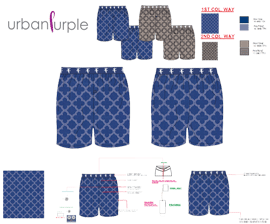 We at Fashion Studio Urban Purple encourage a two way communication between the client and our designers, be it through sketches or references from the web, ensuring ideal technical designs and specification sheets. 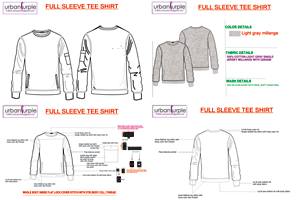 Our tech pack designers at Fashion Studio Urban Purple have the experience of managing a multitude of clients and are fully equipped to understand, analyze and convert your creative vision to factory ready tech packs. Most importantly, we re-iterate the importance of transferring the initial design/ idea coherently to our design team, allowing us to take it from there and process it faster. In short, we take your idea in its raw form and convert it to factory ready tech packs. Tech packs significantly reduce the time and effort required to produce your garments. Apparel tech packs perceptively expedite the manufacturing process by providing information that adapts to your style requirement. A well-made tech pack saves time and money by way of systematic construction detailing. Be more informed on our practices. Please refer our blog Tech Pack Designfor a comprehensive understanding on how we help start-ups and designers succeed. 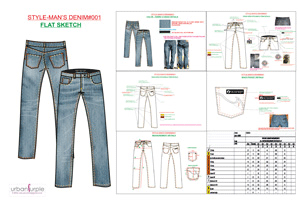 You may send Sketches / Inspiration picture of your styles to create technical apparel design (Tech Pack and Spec Sheet). We would first Go ahead with Styling and Submit the Flat Sketch To You ( Client ) for approval and their comments and inputs. 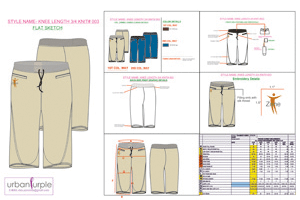 We provide all Technical Apparel Design files through Adobe Reader (PDF) files and Spec Sheet in Excel Sheet. Once We receive the Comments and Inputs we would proceed with Modification and Give the Final Flats for Approval. We would also require the Colorways for the Styles. Once the Flat Sketch are Approved and colorways for the styles are finalized we would proceed with the Technical Design of the Garments. We would require the Logo, Trims Design and Branding Detailing from Your end ( Vectors ) if you have created. If not and you want us to do the branding for you we would do it. Once the Flat Sketches are Approved and We proceed with the Tech Pack Detailing We would not Accept Any Changes in between as we have to change the whole detailing all over again. For Apparel Tech Packs Related Queries Use our Contact Form to Reach us. 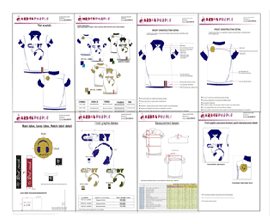 For the Production of Your Clothing Line you may get in touch with us with your tech packs and Spec sheets. We need the Tech Packs of Your Styles to Give you a Quote for Apparel Production. Tech Packs are Important and without the Tech Packs the Production Quote would be incomplete. For Apparel Tech Pack and Related Queries Please use our Contact form to Reach Us. For any production related enquiry, we urge you to get in touch with us with your tech packs and spec sheets We will require the tech packs of your styles in order to provide you with a quote for apparel production. Tech Packs are vital and without it the production quote would be incomplete.